Love, Mrs. Mommy: Brentwood Home Kids Space Bundle Prize Pack Giveaway! $190 RV! 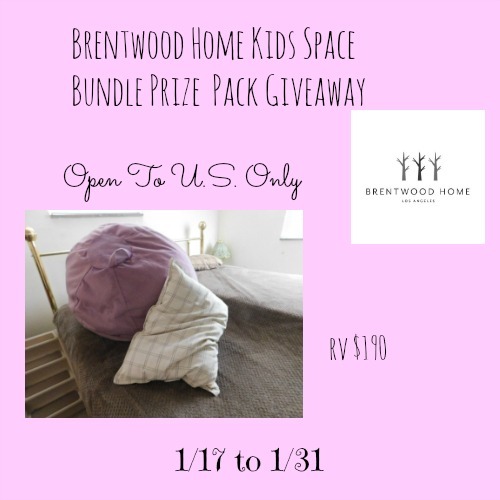 Brentwood Home Kids Space Bundle Prize Pack Giveaway! $190 RV! Brentwood Home is a company that offers products from everything for everybody including your pets. I am in love with this site as they bring the ethos of California to all of our products, handmade for you in LA with healthy, beautiful materials, shipped directly to your doorstep. You can read Tammie's review of the products being given away by going HERE. This Giveaway Is Live And Will End On 1/31 At 7:00 P.M.
Disclosure: The participating bloggers were not compensated for this post. No purchase is necessary to enter. One entrant per household, per IP address. All entries will be verified. Void where prohibited by law. Winner will be contacted by email; Please add pankuch1605@hotmail.com to your whitelist. This giveaway is in no way administered, sponsored, endorsed by, or associated with Facebook and/or Twitter, Google, Pinterest, or any other social media platform. Please contact Tammie at info@tpankuch.com to see your product promoted here in a giveaway. We don't but I would like to!! I think I am going to rearrange my son's room and make him a reading/learning relaxation corner!! Im so excited about it and this would make a perfect addition!! Alysia has an entire half of a living room with a bookcase, table and toys. This would be so cool there. She needs it, where she lives it's very cold for a long winter and she has to play inside. Yes, we have specific kids areas in the house. Their rooms and they have a little play area in the corner of the living room. The kids have a playroom in the basement. They enjoy having their own space. They are pretty good about keeping it clean for the most part. Eventually as a kid I had my own room. It was great!! I could have used some Brentwood Home Products though. *LOL* kristiedonelson(at)gmail(dot)com Thank you. We don't have a "kid" space just yet, but this would help us start one for sure! Somehow I have in my mind (and am loving) an image of Alysia dragging this cool lounger to wherever she wants to settle in and read. My boys had a playroom to play their games if they didn't want to watch tv with us. My painting studio is a place for my nieces and nephews to paint and have fun. We have a little corner in our family room that my kids like to lounge in. My granddaughter has her own room at my house so I can keep all her toys in one place. Yes both my kids have their own space in the play room. Yes, for my sanity the house is sort of divided out in spaces for group activities or for us to hang out individually. My nieces and nephews come over as well and it's difficult not having a big enough hobby space for them all. My daughter has always had her own space. I can see Alysia dragging this under the stairs (where there is carpet and a light!). Yes, my girls have their own spaces. They both have their own room and we also turned our dining room into a play area for them to share. I love when Alysia just takes over a space and makes it her own! Alysia has several spaces to call her own in the house besides her room. Right now the children enjoy closet space that I have, its big enough for books and arts and crafts and they love it. The why of it is obvious, lids need and are entitled to their own space in the home. In one spot we even allow writing on the wall. We do. We have a room just for our grandkids with electronic, toys and board games. This would be a perfect fit. It's getting a tad hard to answer the same question over and over and over again, but yes Alysia has her own spaces - several. We are grandparents to two sweet little boys and we have a room in our home for them for when they visit, thanks! We had a playroom filled with toys as a child we loved it. Tabitha has had her own space. Happy Chinese New Year!g/l to all! We just got our first apartment, my daughter and son have their first bedroom with a closet so big they love to play in it! We would love to win this, thank you for doing the giveaway!